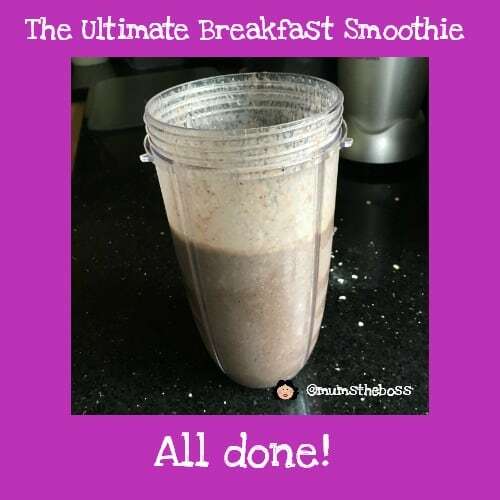 Here is my Ultimate Breakfast Smoothie recipe formula, designed so I don’t have to think too hard in the mornings…. Now the weather is warming up, I find myself drawn to a liquid breakfast and specifically to a smoothie or Nutriblast. 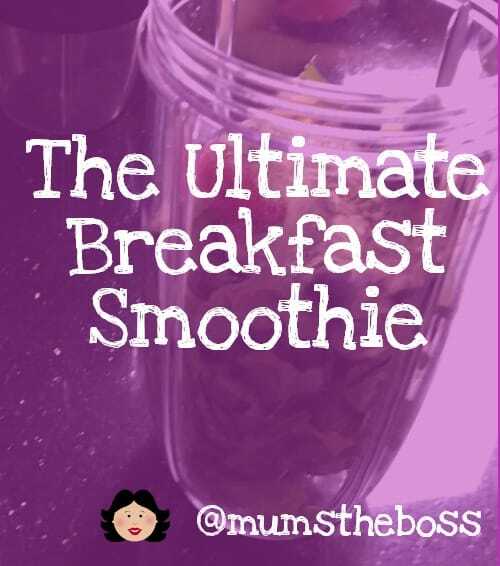 I like to make a breakfast smoothie ice cold, and full of enough goodness and nutrition to fill me up until lunchtime, and to make a good start on my 5 a day. 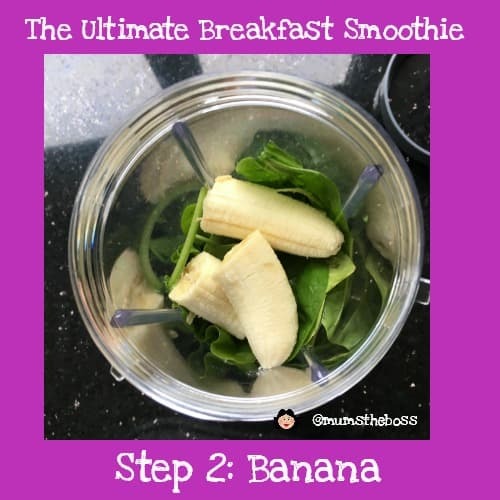 Here is my basic Breakfast Smoothie recipe, with plenty of adaptations, so I do get a slightly different smoothie every day. Although it seems like a lot of steps, if you have your kitchen set up with everything handy it doesn’t take too long to put together. 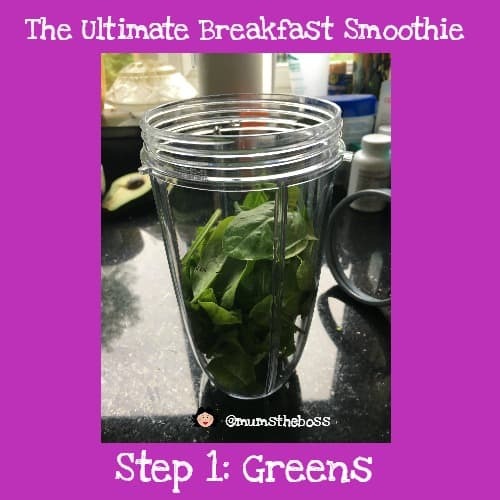 I always start off by half filling my cup with fresh greens. Normally I use fresh spinach, although I have frozen spinach on hand if I run out. Occasionally I use kale, or rocket,and if I have some lettuce or salad leaves left over that are looking a bit limp, then I chuck those in too. The next step is a thickener. If I have one I like to use a fresh banana, which is nice and sweet. Occasionally I use half an avocado, and then I put more sweet things in the fruit section. If I don’t have a thickener, then I generally put in an apple or pear at this point – quartered, with skin on and core removed. The final smoothie is not so thick but it makes a nice change. I have frozen fruit pre-prepared and chopped in the top of my freezer. 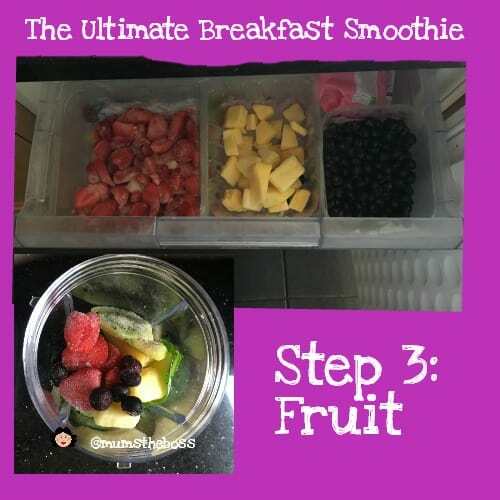 This is where I eat the rainbow as I have the red and yellow box (strawberry, raspberry and banana), orange, yellow and green box (pineapple, mango, melon and kiwi) and a purple box (forest fruits and blueberries). Somedays I just pick from one of these boxes, other days I pick bots from all three. And if I have any fresh fruit lying around that is going a little bit overripe I chuck that in instead. Occasionally I chuck in a carrot or a bit of celery, but mostly I tend to cheat at this point and use a green smoothie powder, because I can’t be bothered chopping up all the fresh veggies. 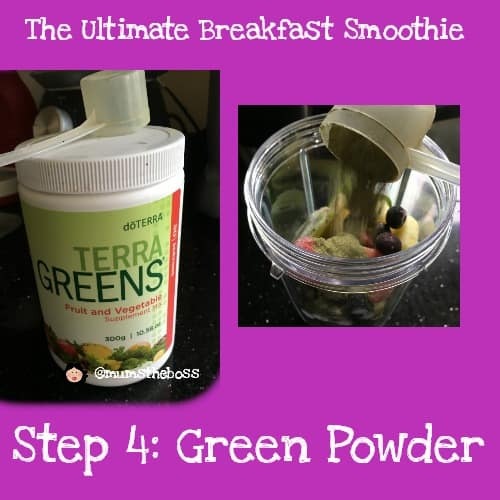 My favourite is Terra Greens from DoTerra, because it contains veggies, grasses, but also some fruit content so the basic flavour is sweet even though it is full of goodies. The basic ingredients are kale, dandelion, spinach, parsley, collard greens, broccoli, cabbage, wheat grass, alfalfa, oat grass, barley grass, pineapple, guava, mango, goji berry, mangosteen , acerola, lemon and ginger. That’s a whole variety of phytonutrients in a single scoop and it really tastes delicious. I love me some Omega 3s in the morning! I get my good fats by either chucking in a handful of mixed nuts or using a flaxseed mix like this one. Sometimes I use peanut or cashew butter or tahini. I love how the Nutribullet can reduce even the tiny seeds to almost nothing so you don’t notice them in the texture. 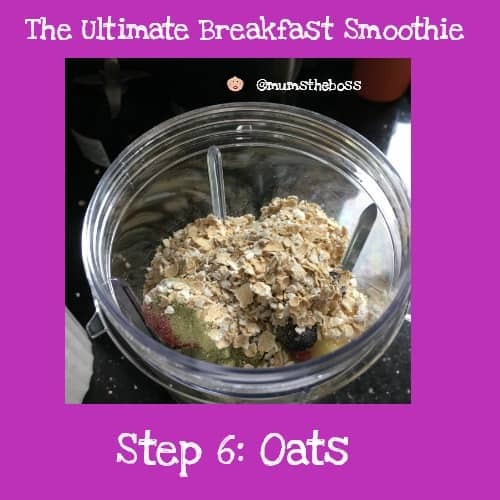 Depending on the other thickeners, and what else has gone in, if I am making a meal replacement smoothie I usually chuck in some oats to thicken it up a bit. and keep me filled up for longer. 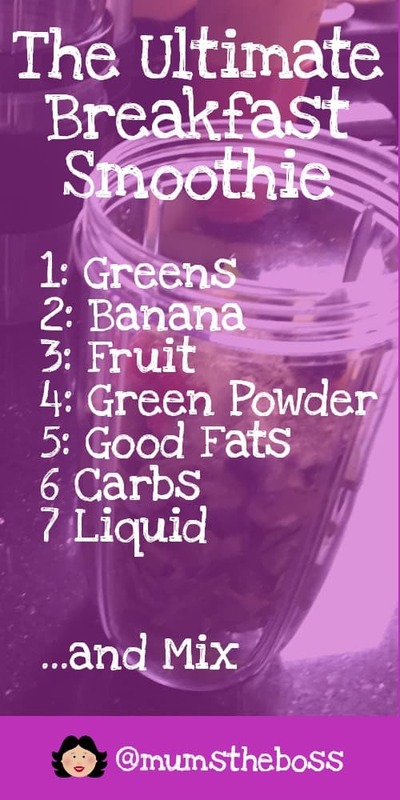 The only problem with eating the rainbow in a smoothie, is that when you mix red, green and purple ingredients together you end up with a sludge brown colour. But with the mix of fresh and frozen ingredients it should be just the right cool temperature, and you can adjust the thickness to taste. The colour doesn’t bother me, as I know it will taste delicious, but if this is a problem then maybe just stick to the orange and yellow fruits and then you will get a basically green mix. 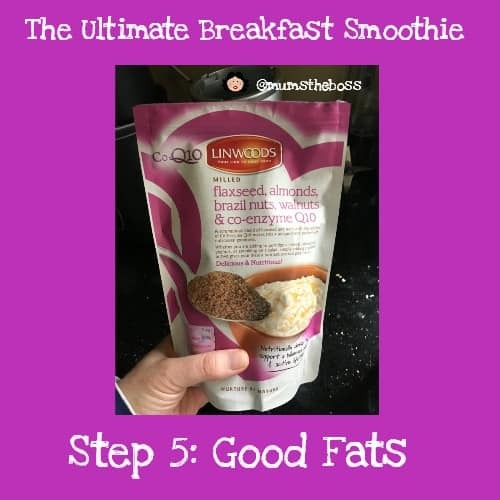 So there it is – my basic Breakfast Smoothie Recipe. Do you like a smoothie or Nutriblast in the mornings? What do you put in yours?